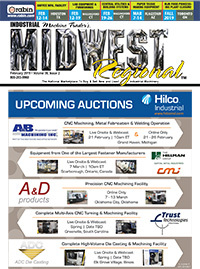 I'm very pleased to deliver your newest issue of our magazine, which is the February 11th, 2019 Midwest Regional / Industrial Machine Trader Edition and the February 11th, 2019 www.myequipauctions.com. I hope you enjoy it! Don't forget! 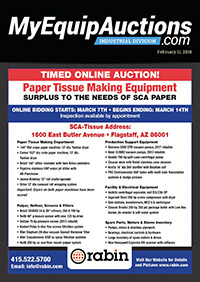 If you are looking to buy, sell or trade any new or used industrial, fabricating, welding or non-traditional machinery, parts, tooling and supplies or maybe you have an auction coming up or are interested in going to an auction, give us a call at 1-800-203-9960 and we'll do our best to help you out in both a timely and cost effective manner! 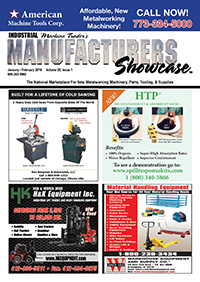 Follow us on Social Media and view our latest issues of: Industrial Machine Trader, Fabricators Hot Line, Midwest Regional, Manufacturers Showcase and My Equip Auctions! 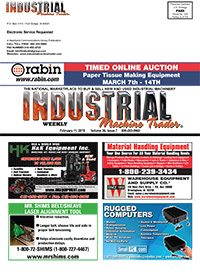 Search through our database of current listings of both new and used industrial, fabricating, welding machinery, parts, tooling, supplies and auctions, industry news, videos, blogs & much more! Please feel free to send me your company press releases, product spotlights, or industry news that you'd like for me to consider publishing on our website, digital newsletter or in any of our publications. I'm always happy to hear from our loyal readers, send your comments and ideas to my email: virginiar@industrialgroup.com. Will Robotic Process Automation Rule the Manufacturing Enterprise in 2019? 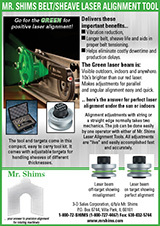 Spindle Drawbar Force Gage - Call Clamprite For All Your Drawbar Testing Needs! Industrial Lift Trucks & Heavy Handling Equipt. - New & Used - Cap. 3,500 - 110,000 LBS. 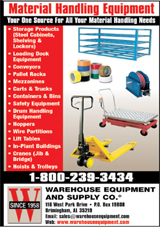 Material Handling - Corrugated Steel Containers, Skids & Pallets for Industry. MANUFACTURER & DESIGNER OF TURNTABLES, LIFTING & CONVEYING SYSTEMS & MORE! Accudyne Products, LLC Federal Knife, Inc.
FADAL #VMC4020 CNC VERTICAL MACHINING CENTER, 2007. DMC DL80V CNC VERTICAL TURNING CENTER, 2013. Floor Type HBM, 4"-6", 144" X-Axis Travel, Overall Length Needs To Be Less Than 20'. If you give us your email address to receive email publications or notifications of posted publications or events, we will use the email address to send you the requested item. 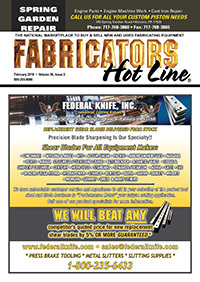 We may also contact you via email with information about a Heartland product or one of our trusted marketing partner's product, service, or special offer. We will not rent, sell, or give your email address to any third party. Heartland accepts no liability for the content of this email, or the consequences of any actions taken on the basis of the information provided, unless that information is subsequently confirmed in writing. If you are not the intended recipient you are notified that disclosing, copying, distributing or taking any action in reliance on the contents of this information is strictly prohibited.